Live Wheel of Fortunes - Experience the different type of wheels. Live Wheel of Fortunes online is starting to become popular with Live Casino software providers. I can’t really trace who was the first to deploy a live casino wheel, but in terms of this site, the BetGames Wheel of Fortune was the first I came across. 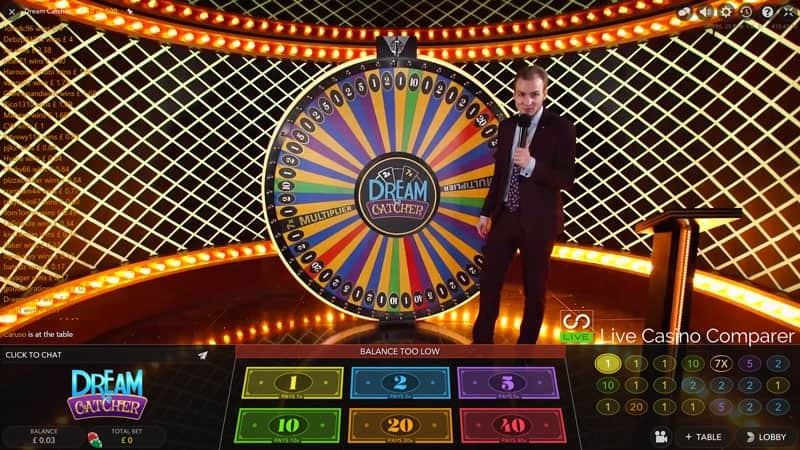 Then about 2 years later Evolution Gaming launched their wheel of fortune, Dream Catcher. Wheel of Fortunes have been around in several different guises for years. These money wheels are popular in US and UK land based Casinos. However most people of a certain generation (80’s – 00’s) will know them from the popular US & UK TV shows “Wheel of Fortune”, where contestants would spin the wheel to win prizes. Are all Wheel of Fortunes the same? The wheels themselves come in different sizes and have varying amounts of segments depending on their use. What’s common between them all is the wheel is mounted vertically and is spun in a clockwise or anti clockwise direction. Usually a leather strop runs over the segment separators and slows the wheel down until it eventually stops on a winning segment. There is no set number of segments on a wheel. Dream Catcher has 54 Segments while the Betgames Wheel has 19 and Spin A win has 53. The segments can be number colours or both. These are the two most popular. I have seen others with pictures of prizes or even animals, as was the case at a local fair. Although I don’t think you actually won an animal! What sort of betting can you do? Typically you can bet on a number or colour or odds and evens. Payouts for the different bet types are calculated on the makeup on the wheel, so I can’t really give you an accurate idea. However if there is an even distribution of say colours, then that might pay even money. A bit like Roulette would pay. Betgames Wheel of Fortune has 19 segments, numbered 1-18, with an additional prize Symbol. The wheel is also divided into 3 colour segments Black, Grey and Red. Bets can be made on number, colours and odds and evens. Game round run every 5 mins and the game is presented in a very TV type way. There is not glitz or glamour, it’s very factual and robotic, so don’t expect any feedback or interaction with the presenters. You can play at Dublinbet. Evolution Dream Catcher is a different kettle of fish. The wheel has 54 segments, 6 numbers are used that are dispersed around the wheel, with every number represented a different number of times. Two additional segments have Multiplier figures, which if landed on are applied to the next win. This makes this wheel unique. You just bet on which number the you think the strop will stop at. 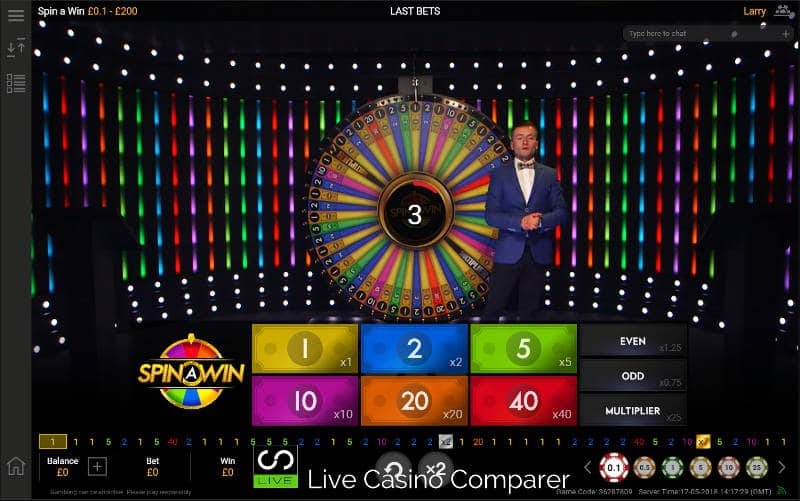 Unlike the Betgames Wheel, this game is fully interactive with players, who are encouraged to chat and speak with the presenter. The presenter is a showman and is there to entertain, so if you want a fully immersive experience then try playing at one of the Evolution Live Casinos. If you want one to try then Mr Green is a good place to play. Playtech Live Spin A Win looks remarkably live Dream Catcher, but it isn’t the same game! Spin A Win has 51 number segments and two multipliers, a 2x and 7x. You can bet on the 6 numbers, each has a different payout which is relevant to the number of times the number appears on the wheel. The highest payout is for number 40, which appears once and will bag you a 40:1 payout. Number 20, appears twice and pays 20:1, while number 10 is on the wheel 3 times and pays 10:1. Number 5 has 7 slots, with each one giving a payout of 7:1. Double your money on number 2, with 15 occurrences at 2:1. The Even money payout is left to number 1 which appears 23 times, no wonder it’s the most common number to be hit. What sets Spin A Win apart is an additional side bet. The side bet can be play alongside the main hand and also on its own. In the RTP’s opinion this offers a better return, with a bet on Odd giving a return of 0.75:1 on the 30 numbers it covers. It has an RTP of 97.22%. An Even number bet gives 1.25:1, but only 21 even numbers cover the board. Alternatively bet on a multiplier coming in for a 25:1 payout. In my experience the multiplier tends to come in every 50 spins or so! 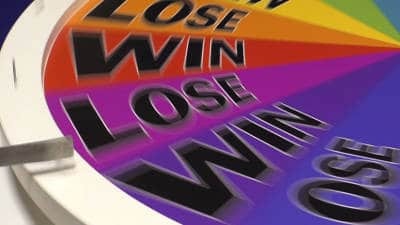 The game is Live, and the wheel is manually spun with gravity and a rather strange looking strop slowing down the wheel until a winning number is chosen. If you fancy, Bet365 and BetFred and good options.